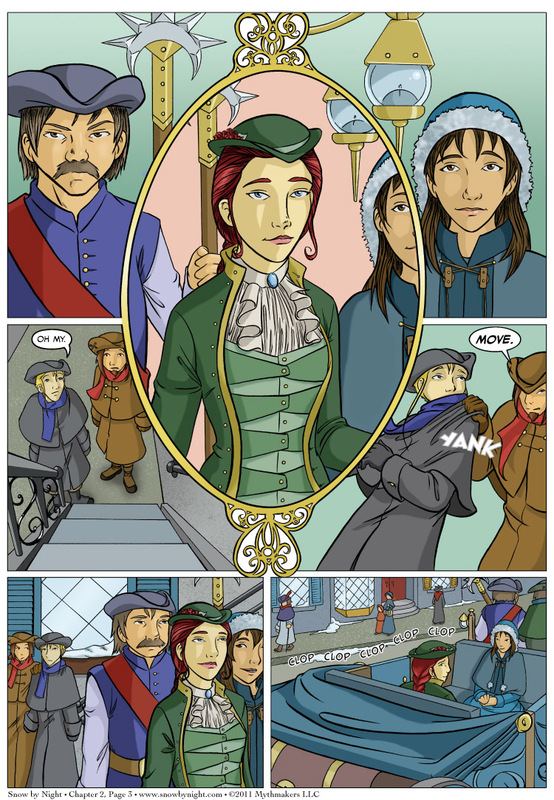 Chapter 2 page 3 is up in which Blaise and Jassart meet a very special lady. As for who she is, she is the subject of this week’s almanac entry which will go up on Friday. And hurray! We’re now posting twice a week. I’m very pleased that we are taking this step. I’m really looking forward to sharing twice as much a week as I was before. In addition to webcomics, I’m a pretty avid RPGer. In fact, I just had an article published by Wizards of the Coast. If you’re a fan of the Forgotten Realms, then you may enjoy my article on Daggerdale, which brings the dale up to the most recent date of 1480 DR. It’s been getting great feedback on the D&D forums. Brittany, Diane, and I will be at Otakon at the end of the month. We’ll have buttons and books for sale. The expressions in this page especially (but also in the comic as a whole so far) are so very telling. The subtlety and flexibility are admirable!